1lb large (21-25ct) Shrimp, peeled and deveined with tails on. Heat olive oil in frying pan over med heat. Add sliced garlic and fry until garlic is toasted a medium brown. Remove garlic from pan and put aside. Add the red pepper flakes to oil and let sit a minute before turning heat to med-high and adding shrimp, wine and paprika. Saute stirring often until shrimp is pink and done, about 3 minutes. Remove from heat, add garlic and parsley and serve over angel hair pasta. 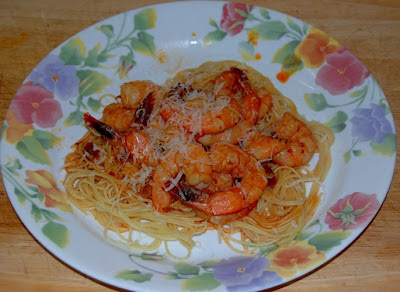 Garnish with shredded asiago cheese if desired.